So, you have a Porsche 996/997 and love it. But lately, the overall performance has left you looking for something more. After looking at the the usual headers, exhaust, intake, ECU flash, etc. you are impressed by the selection, but these won’t get you the performance you truly desire. You are looking for mind bending acceleration and insane power ready to go at a moments notice. What to do? TPC Racing has now raised the bar for performance for the Porsche 996/997 Carrera with our new TPC Racing 996/997 Carrera Turbo Kit. Are you ready for the most exhilarating and exciting Porsche 996/997 Carrera driving experience ever? With the TPC Racing 996/997 Carrera Turbo Kit, we aimed to create a system that would match/surpass the performance of a 997Turbo. And, with up to 520hp and 450lb/ft of torque on tap*, the TPC Racing 996/997 Carrera Turbo is ready to take on any challenges the road has to offer. So, you have a Porsche 996/997 and love it. But lately, the overall performance has left you looking for something more. After looking at the the usual headers, exhaust, intake, ECU flash, etc. you are impressed by the selection, but these won’t get you the performance you truly desire. You are looking for mind bending acceleration and insane power ready to go at a moments notice. What to do? 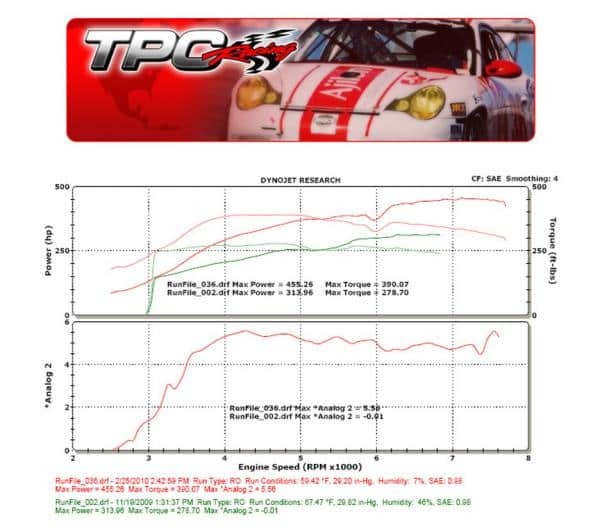 TPC Racing has now raised the bar for performance for the Porsche 996/997 Carrera with our new TPC Racing 996/997 Carrera Turbo Kit. Are you ready for the most exilerating and exciting Porsche 996/997 Carrera driving experience ever?